Rumours of a Microsoft Surface smartphone began to bubble up not long after the first Surface tablet was launched. As WMPU reports, such a smartphone was first in the news around three years ago when a device codenamed Project Juggernaut Alpha appeared in GPS logs around Microsoft's campus in Seattle. Yesterday new details concerning this 'mythical' smartphone were published by WMPU. The Windows Mobile orientated news website got a tip off from its sources, spilling a pretty comprehensive list of tech specs for the rumoured Microsoft Surface smartphone. It also published a screenshot said to come from the same device being tested with a preview build of Windows 10 Mobile. Further information gleaned from WMPU's report says that the handset isn't yet able to run Win32 apps. I'd like to see a Surface smartphone with an Intel or AMD x86 processor. However the above specs and rumours are all we have to go on right now and they're only from one source. Picking through some of the key specs, the current Intel Atom x3 (SoFIA) 64-bit processor isn't able to support other key hardware purportedly in the device such as; the screen (resolution) and camera (pixels), nor USB 3.0 or dual-screen Continuum productivity. If the essence of the rumour is correct it is possible that when the Surface smartphone appears there will be a newer Atom x3 from Intel to support the rest of the spec, or another more powerful processor will be employed. We do expect to see some new Microsoft smartphones soon, but probably not this Surface Mobile. IFA starts on 5th September and Microsoft will be there rubbing shoulders with LG, Samsung, Sony, Motorola, HTC, Huawei and other key mobile technology players. Current x3 atom doesn't support that resolution…. Deaf people would be OK with them being sold without the speaker, there are different redundant components for different people - but making 101 SKUs really complicates the manufacturing and sales, which pushes up costs and just makes it a bad idea. Most people use the speaker, the camera, etc. so numbers of units shifted without them would be tiny and probably not cost effective. I would take this with a grain of salt, as Microsoft has already been making windows phones through Nokia's Lumia line of phones. 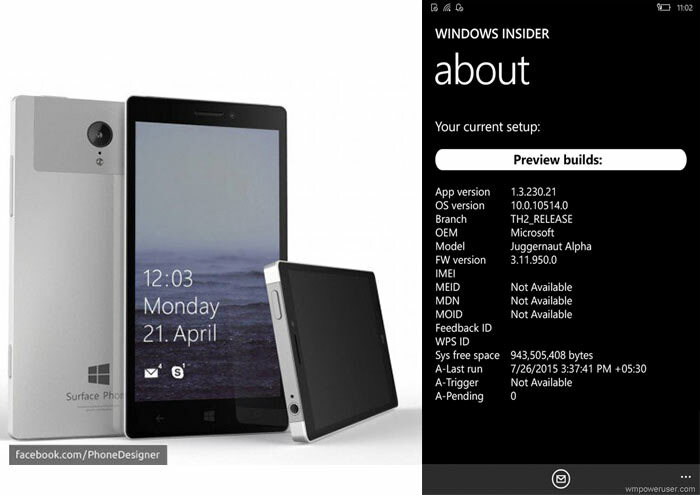 Unless this will be their halo phone in the Lumia line, then hurray for no more plastic.